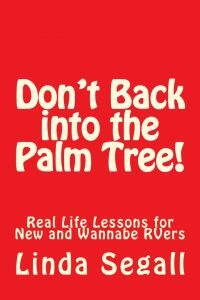 Reluctant RoVer – Don't Back into the Palm Tree! Don't Back into the Palm Tree! Don’t Back into the Palm Tree! Author Linda Segall admits she got into RVing “kicking and screaming” (only a slight exaggeration). RVing was her husband’s idea and dream. He wanted to buy a motorhome, sell their “stick and bricks” house, and travel full time. Linda was not willing to give up her house, but she did agree to go on extended RV trips across the country. As they began to master the art of living in an aluminum and fiberglass box-on-wheels, Linda began to journal about their adventures and inevitable (mis)adventures. She called her blog the Reluctant RoVer. It did not take long for Linda’s reluctance to rove to disappear, but the name of her blog remained. She continues to journal about their adventures and fewer and fewer (mis)adventures whenever they travel. Don’t Back into the Palm Tree! Is based on her blogs.